Please read our Terms & Conditions below. By placing an order with us, you confirm your agreement to the terms and conditions below. Should you have any questions about any aspect of your purchase, we suggest you contact us before placing your order. Meg Heath Dog Leads does not accept any liability for misuse of our products. In the event of injury, Meg Heath Dog Leads does not accept liability. In the unlikely event of you not being completely satisfied with your purchase from Meg Heath Dog Leads we are happy to offer a refund or replacement of items returned to us subject to the terms and conditions below. We do offer a 5 Year Guarantee for breakdown of stitching. A replacement item will be given in this case, or you will get an automatic upgrade of product. If the item is deemed to have suffered from excessive or misuse, you may be charged for replacement or repair. Your order is delivered by APC / Lincolnshire County Couriers and we use a next day service, however this does not mean that your order will be delivered the day after your order as we have to make your order. If you would like to find out when your order is likely to arrive please ring us on 01522 810150. Please take care to make sure you have ordered the right product before you pay. 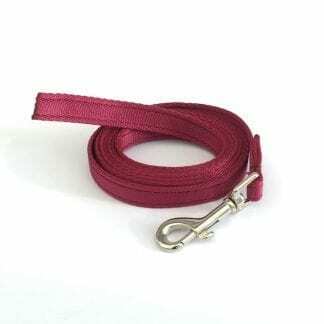 Because all of our leads & collars etc are bespoke (your order will be made especially for you!) we will not accept any changes to an order that has already been made or on orders where a non stock colour has been ordered for you. If you send an email to add to or change an order we cannot be held responsible for any resulting errors in your order. We work to the automated order that comes through. If a mistake on the Clients part results in a cost to Meg Heath Dog Leads, you may be liable to an extra charge to cover these costs. If you really do need to change an order then this must be confirmed by telephone or by obtaining confirmation from us either by telephone or email where we will state that we accept the changes. Unless otherwise stated our standard products use 19 & 25mm webbing & nickel plate trigger hooks and rings / plastic fittings such as slide adjusters and side release buckles. We can also provide brass fittings for some products. Sometimes we may need to send the next nearest colour if your chosen colour is out of stock, please state if the colour is important as we may charge a re stocking fee of 20% for exchanges of colour. 1 Metheringham Heath, Nocton, Lincoln. LN4 2AJ. In the unlikely event that an item is faulty through a stitching or material defect, please contact us (see ‘Guarantee’ above). You the Client, have a cooling-off period of 7 working days in which to cancel your order, starting from when the goods are received, without having to give a reason. The right to withdraw can be exercised by the client, even after the goods have been delivered, or the services have been provided. The client is entitled to receive a full refund for a cancelled contract within 30 days. Exceptions to this are goods made especially to order. A refund will be made for the value of the goods (excluding P&P), if you paid by Paypal, it will be less any Paypal costs. If an alternative product is required, P&P will be charged. We also charge 10% for goods returned that were ordered incorrectly by the customer. Items returned as unwanted will be subject to a 10% fee and postage at customers cost. 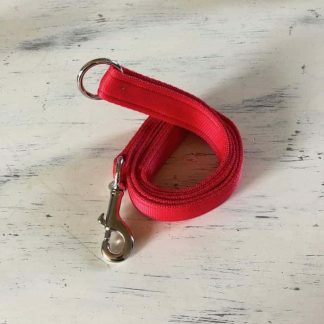 In the case of wrong sizes, we strongly recommend that you check your dogs neck size / length of lead if you are in any doubt please enquire as to whether your chosen product is suitable. If you choose to cancel your order after entering your details, any transaction charges incurred by us will be deducted from your refund. PLEASE NOTE THAT ANY PRODUCT USING BRASS OR ANY MATERIAL COLLARS ARE CLASSED AS A BESPOKE ORDER AND IS NOT REFUNDABLE. Ordering out of stock items. In the event of you ordering an item that has become out of stock, usually a delay of 3-5 days will be added on to the length of time it would usually take to deliver your item. If it is something that cannot be restocked we will ring you and offer a replacement. If we cannot get hold of you by email or phone, it will be assumed that having read the terms & Conditions, you are happy to accept a similar product. In the case of an item having to be returned that is deemed to be Meg Heath Dog Leads at fault we will refund your postage both ways too. This agreement is a legal document which sets out your rights and obligations and those of Meg Heath Dog Leads. Prices include VAT but are subject to delivery charges as stated at the checkout process. The personal information we hold about you is collected at the time you place an order with us. The information we hold about you is kept by Meg Heath Dog Leads and is never passed on to any third party. By using the Meg Heath Dog Leads web site and ultimately making a transaction, you are agreeing to our terms & conditions. Every sale shall be deemed to be performed in England; English law shall govern each transaction, including (without limitation) all contractual and other relationships, which arise as a result of such sales. You and we submit to the non-exclusive jurisdiction of the English courts in relation to any disputes arising out of any sale. In return for the service we give you, we ask that you agree to use your correct name, address and any other details. You may be asked to enter credit, debit or other banking account details. You must ensure that (a) you are fully entitled to use that bank account at the time when you provide those details and when you use the bank account, and b) the account has available funds to cover all charges incurred. If any of the information you enter becomes incorrect or is superseded, then please notify us with the correct information immediately. To register for Meg Heath Dog Leads services, you must legally be able to enter into contracts for goods and services that you may buy here. This means that you must be at least 18 years old and sane. Meg Heath Dog Leads reserves the right to cancel any order it feels has been carried out illegally. Descriptions of goods and services included in the Meg Heath Dog Leads site are accurate to the best of our knowledge. We do our best to correct errors or omissions as soon as we are aware of them. However, you should know that the colours and appearance of images may vary very slightly from the way they appear on the screen. 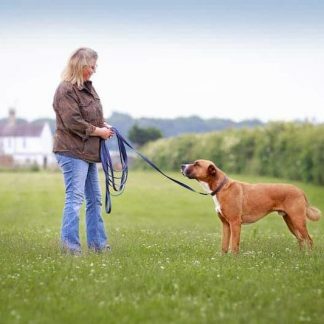 You are requested to accept that the images and designs used on the Meg Heath Dog Leads website are the property of Meg Heath Dog Leads or their respective copyright owners, and are used by Meg Heath Dog Leads pursuant to express authorisation from copyright owners or their agents. You acknowledge that all copyright, trademarks and other intellectual property rights in and relating to Meg Heath Dog Leads are vested in Meg Heath Dog Leads or our partners where appropriate. You must not use, reproduce, modify or distribute any images or text content whatsoever. Please be aware that we will not be liable to you or any third party for any loss, indirect loss or damage, or for any loss of data, profit, revenue, business or management time, howsoever caused. You also agree that the liability of Meg Heath Dog Leads under this agreement (whether arising in negligence or otherwise) will not under any circumstances exceed an amount equal to the sums paid or payable by you for the said transaction. In the event of consequential loss, Meg Heath Dog Leads can only be responsible for the cost of your order. Nothing in this agreement limits Meg Heath Dog Leads liability for personal injury or death resulting from our negligence. Meg Heath Dog Leads shall not be liable for any failure to perform in its obligations under this agreement if caused by matters beyond our reasonable control. Meg Heath Dog Leads reserves the right to change the terms of this agreement from time to time. The new version will take effect from the day of change. Price and availability information are also subject to change without notice. The winner will be chosen on 31st March after 18:00 hours. The winner will be notified within 7 days after this time. Entry is by commenting on this page as per the above question. This competition is open to UK residents with a UK postcode only. There is no entry fee and no purchase is necessary. By entering this competition, the entrant is indicating his/her agreements to be bound by these terms & conditions. The competition is being run on Facebook, Instagram, Twitter and via our mailing list. Only one entry per person but you may comment multiple times below. We reserve the right to cancel or amend the competition and these terms and conditions without notice. Any changes to the competition will be notified to entrants as soon as possible by the promoter. We reserve the right to substitute the prize with another of equivalent value without giving notice. Each entry will be numbered and chosen at random by a number generator. The prize will be delivered by post or courier.